The National Shooting Sports Foundation (NSSF) has created a video with helpful tips on mounting scopes, and adjusting the position of scopes to suit the shooter. This video, hosted by Ryan Cleckner, a former U.S. Army Sniper instructor, is aimed primarily at “hard-holders” who shoot prone. 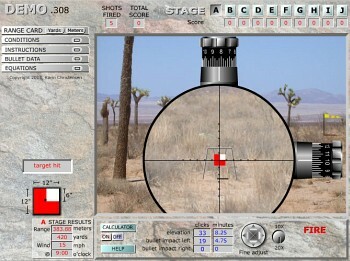 The video should prove useful for tactical shooters, varmint hunters, and F-Class shooters. Ryan does explain that, if you plan to use your rifle in standing, sitting, and prone positions, you need to set the scope in a “happy medium” position that provides sufficient eye relief in all shooting positions. Ryan has an interesting method for leveling a rail-mounted, flat-bottomed scope (i.e. one with a flat surface under the turret housing). 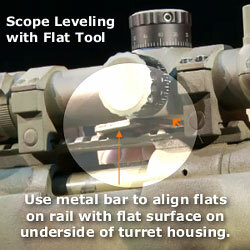 He simply inserts a small metal bar between rail and scope, and aligns the straight edges along the bottom of the scope turret housing with the flats on the rail (see photo). Watch how he does this on the video — it’s pretty clever. 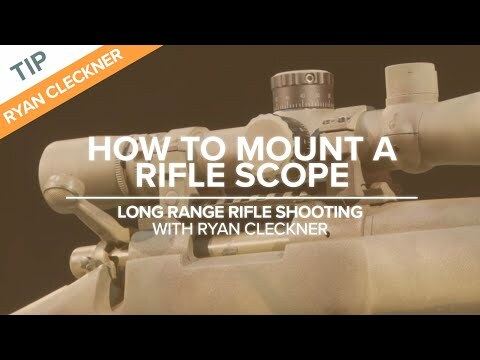 One other highlight of the video is the segment where Ryan shows how to adjust the ocular on his Leupold scope to provide the best (sharpest) image of the reticle. Ocular/reticle adjustment is covered in minutes 11:00-13:00 of the video. The video has some faults. Some of the advice, such as “always mount the scope as low as possible” is counter-productive for benchrest shooters who want to keep their heads OFF the stock. In addition, Ryan does not explain that, with a variable power scope, proper eye relief may change considerably with the level of magnification. If you have an 8-32X scope, for example, you can set everything up perfectly for 8X magnification, only to find that you need a LOT more eye relief at 32X. We recommend positioning the scope so it provides sufficient eye relief at the highest magnification you regularly use. Share the post "NSSF Video Provides Helpful Scope Mounting Advice"
Trust us, you can learn a great deal from the Free Demo. This is not just a shooter video game. The demo offers a variety of scenarios–enough to keep you occupied for quite some time. 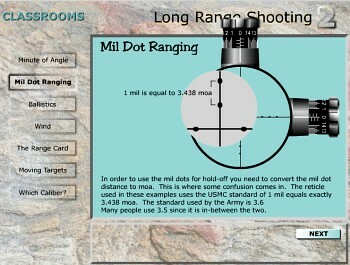 If you want to learn more, the full CD, with hundreds of scenarios, and five bonus stages, costs $43.95 from ShooterReady.com.